Clara Mae Wexstaff, 90, a longtime resident of Grand Haven, MI, died Sunday March 31, at a local care facility. She was born May 30, 1928 in Grand Rapids, MI. As a young child, Clara moved to the Kaleva/Brethern area with her mother and siblings Jerry & Mary. She graduated from Brethern H.S. in 1946. After graduation she worked for the phone company and lived in Manistee where she met Robert Wexstaff. They were married in 1947. Clara was well known for her many years at Security First & Old Kent Banks in downtown Grand Haven. When she wasn't working, you might see her bowling in a league at Starlight Lanes, or swinging a club at one of the local golf courses. Besides these sports, she loved to sing and was a 40+ year member of the West Shore Sweet Adeline Chorus. Her memory for lyrics and music was renowned and she sang songs right up until the end. Clara Mae had a big life! She was preceded in death by her husband Robert, sister Mary, sister-in-law Joyce, half-brothers Charles & William, youngest son Jimmy, and oldest son David. She is survived by her brother Jerry (Loretta), half-sister Alyce, half-brothers Terry & Don (Alice). Also her children, Susan (Tom) Niemi, Marilee Wexstaff, Robert (Carole) Wexstaff, Jeanne Rance and daughter-in-law Dona Ingersoll Wexstaff, 3 great-great, 8 great, and 10 grandchildren, along with her constant companion her yellow cat Sweet Pea. 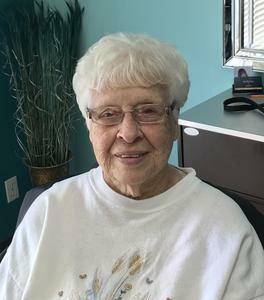 A memorial service for Clara will take place at St. John's Episcopal Church, Grand Haven, MI at 3 pm on Sunday, April 28, 2019. The Rev. Jared C. Cramer will be officiating with the assistance of Rev. John Hills and Rev. Robert Strey. The family requests no flowers but suggests a donation in Clara's honor to: Hospice of Michigan, www.hom.org/donations/ or Harbor Humane Society, https://harborhumane.org/donate/.